It’s time to be inspired and release any attachment to staying aloof or alienating oneself from the outside world. 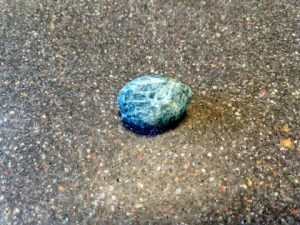 I don’t know about you, but it feels like the energy around us is starting to ramp up – to what, I have no clue, but Blue Apatite is calling to you to be mindful of how you are communicating in all aspects of your life. From speaking with others (family, friends, colleagues, the stranger on the street), to how you’re communicating to yourself (mindset about a job well done or not so well done, are you raising yourself up or constantly beating yourself down? ), and to how you’re creating with your energetic or spiritual team (how do your conversations with God or the Divine or your guides sound?) – you’re being challenged to become more conscious of not only what you say but how you say it, the energy behind your words. Blue Apatite is helpful on the communication front with its association with the throat chakra, but it has a higher purpose of creating and strengthening community. So much of the negativity around us is based on the old structure of you vs me, haves vs have-nots, us vs them, status, inequality, etc. Rather than allowing yourself to stay in the same vibration and automatically respond to such conflict as “well, that’s just the way it is”, the time is now to challenge that automatic response and foster something “new” – a better, kinder, more loving world. No, it won’t make change things overnight, but you truly never know what a kind word, a kind action, or a simple smile will do to those around you. All the good adds up to make a positive impact on the world. For sure, feel free to join a cause you’re inspired for and become active if that’s how you’re called. But draw inspiration from the little acts too. Can you recall the last time you looked someone in the eye and gave a genuine thank you for a kind act? Holding the door open for you, helping you with a bulky package, retrieving a forgotten or dropped item? Connect with others someway, somehow, and make sure to bring love and joy into those connections. You may be surprised how this mental shift, even if it is so slight, can transform your energy, your mood, your whole day sometimes. And that, in turn, will shift the energy of those around you.